Jesus Santrich, a former peace negotiator, is accused of drug trafficking by a court in New York. He planned to export 10 tonnes of cocaine worth $320m (£226m) to the US, Colombia's Attorney General Nestor Martinez said. Mr Santrich will remain in custody until the US requests his extradition. One senior Farc member, Ivan Marquez, said the arrest was one of the worst moments for the peace process. 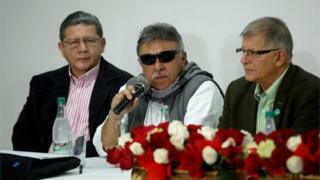 Mr Santrich, whose real name is Seuxis Hernández Solarte, is due to take up his seat in Congress in July. "Those detained have betrayed the values and the principles of the peace deal," Mr Martinez said in a televised address alongside President Juan Manuel Santos. The president said the alleged offences happened after the peace deal was signed in 2016, as under the peace treaty previous drug crimes are no longer punishable by law.